Alt Gobo always likes to get the camera higher. Here is a solution that does not involve aircraft. The best way to get a clean shot across a crowded room is to get the camera (and subject too) elevated. When recording long events the operator needs a place to stand or sit too. Here is a solution Alt Gobo designed and built. This system provides a sturdy camera platform and a wide platform for the operator. The two are separate so operator movement is not translated to the camera. The components are simple with two collapsible 24” stage risers. 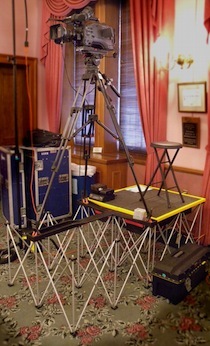 A folding track supports the tripod. The operator platform is a two-piece 3x3 deck. Under the decks are compartments that holds and protects all the components, including the 24” stool. The rig is easy to cart through doorways when moving gear but is a little heavy at 58 pounds. “I like the wide platform. It allows me to shift my weight or even sit down which is great when rolling on long speeches,” says Alt Gobo DP Peter Roof. The platform also features an anti-fatigue surface with an easy to see and feel edge. The support for the tripod only needs to support the legs leaving no surface for wandering guests to sit or set their stuff which can unexpectedly shake the camera. If space is tight the platform is large enough to accommodate the operator and camera but not as shake-free for the picture. If really necessary the two riser sections could be stacked for a 48” riser. This new tool can provide the necessary vantage point for superior picture quality when covering important events.